Tags are a way for you to categorize content with simple keywords. The usefulness in tags is apparent when you need to search your data for commonality. In this way, tags are like “traits”, and you can find related content with the same “trait”. Loyal: Amy and David would show up in the search. VIP: Amy and Bob would show up in the search. Loyal and VIP: Amy would show up in the search. Furthermore, tags are not restricted to just contacts. You can tag almost anything within Method: activities, opportunities, transactions, to name a few. Whenever you are editing a record, whether it be a contact, a transaction, or an activity, the tag field is an editable text box where you can type in a tag. Selecting a Tag - When you click in the text box, a list of recent tags will show which you can select. Creating a new tag - If the tag does not exist, you can type in a new tag, press enter, and the tag will be created. Searching a tag - If the tag does exist, typing in the tag field acts as searching for the tag. A list of tags that partially match what you have typed will show up. You have the choice of selecting a tag from the list, or creating a brand new tag. Adding multiple tags - To add multiple tags, press enter after each tab while typing. Deleting tags - And finally, to remove a tag, click the small x on the tag you wish to delete. One final thing, tags are auto-saved. As soon as you add or delete a tag to a record, it is applied immediately. You do not need to save the record to confirm the addition or removal of a tag. By clicking on the Manage Tags link in the menu of the tags dropdown, the right panel opens up with a list of the existing tags. Hovering over each tag will show three icons which will allow you to rename, merge and delete respectively. Note that the colored square is also clickable! Color: clicking the colored square allows you to change the color of a tag. Remember to click the checkmark to accept your change. Merge: Choose the tag you will merge into. All records with the previous tag will now be the tag you chose for 'merge into'. 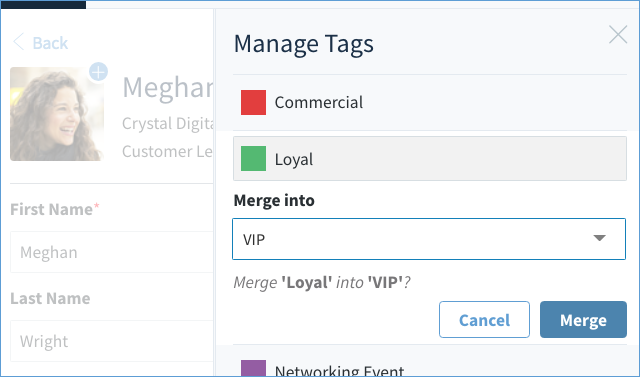 In the below example, all records tagged with 'Loyal' will now be tagged 'VIP'. The 'Loyal' tag will no longer exist.